- Lanes 2 and 3 will be closed on the A2 westbound between the junctions with the A2260 and M25 from 10pm tonight until 5.30am tomorrow due to planned roadworks. - Lanes 2 and 3 will be closed on the A2 westbound at the junction with the M25 from 10pm tonight until 5.30am tomorrow due to planned roadworks. 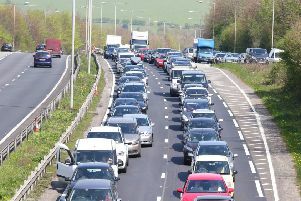 - Emergency roadworks are planned on the M25 anticlockwise slip between junctions J1A and J31 from 10pm tonight to 5am tomorrow – all lanes will be closed. - There is engineering work affecting Great Northern/Thameslink/Southern/Gatwick Express services today and tomorrow.